Did you mean Francis Bacon (painter)? 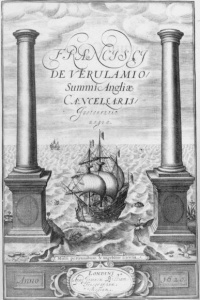 Cover of Novum Organum, a philosophical work by Francis Bacon published in 1620. Francis Bacon, 1st Viscount St Alban KC (22 January 1561 – 9 April 1626) was an English philosopher, statesman, scientist, lawyer, jurist, and author. Although his political career ended in disgrace, he remained extremely influential through his works, especially as philosophical advocate and practitioner of the scientific revolution. Indeed, his dedication may have brought him into a rare historical group of scientists who were killed by their own experiments. His works established and popularized an inductive methodology for scientific inquiry, often called the Baconian method or simply, the scientific method. His demand for a planned procedure of investigating all things natural marked a new turn in the rhetorical and theoretical framework for science, much of which still surrounds conceptions of proper methodology today. Bacon was knighted in 1603, created Baron Verulam in 1618, and Viscount St Alban in 1621; without heirs, both peerages became extinct upon his death. A complete chronological Bibliography of Francis Bacon. (Many of Bacon's writings were only published after his death in 1626). Unless indicated otherwise, the text in this article is either based on Wikipedia article "Francis Bacon" or another language Wikipedia page thereof used under the terms of the GNU Free Documentation License; or on original research by Jahsonic and friends. See Art and Popular Culture's copyright notice. This page was last modified 23:04, 28 December 2018.